The Dynamic Chain Setup Tool helps any artist using Maya to get nHair simulated joint chain. Easily create secondary animations for your character or prop while having a full control over the animation with a generated control rig, plus many options to manage your simulation for production. This video is out of date. More features have been added to the tool described in the tool breakdown sections below. In the video demonstration, the tool is used to generate a control rig that can be switched to a dynamics rig and blend between both. The tool also allows you to select different setup components, bake your simulation onto controllers designed specifically for baking the animation and replace the hair system or the nucleus. There is a new DynamicChain menu added to this version to allow fast access to the most common and used functions. 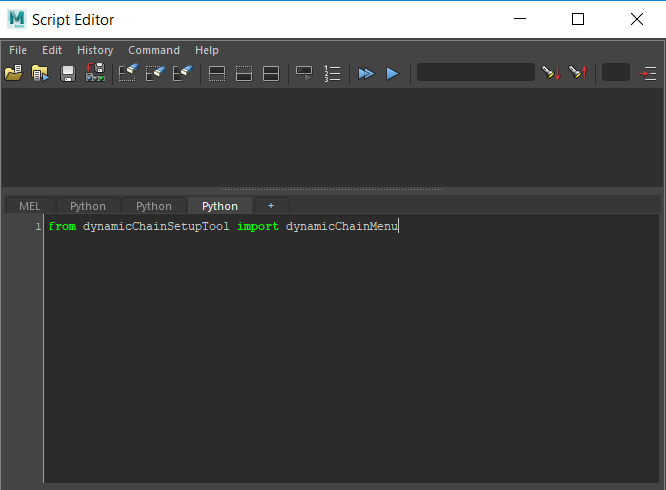 1-Place the dynamcChainSetupTool folder in your scripts folder like the example below. Add the Start joint using the Get Button next to the Start Joint Field. Add the End joint using the Get Button next to the End Joint Field. Choose the number of controllers you would like to have for your rig in the CTRL NO spin box. The bigger the number the smoother the Spline IK curve, a higher number is especially important if you have a long joint chain. You can choose a custom curve for your Spline IK but note that in this case the Ctrl no field will be disabled and instead the number of controllers will be equal to the number of CVs of the curve. Choose your controller shape from a list in the CTRL Shape combo box. Add a Prefix for the generate rig components. You can assign the rig a new Nucleus by just selecting new in the Nucleus Combobox, or choose an existing nucleus in the scene. You can assign the rig a new Hair System by just selecting new in the HairSystem Combobox, or choose an existing hair System in the scene. In the Utilities Tab you have a set of useful selections needed while using the rig. Make sure to select one controller in your rig so the tool can get the information from before selection. 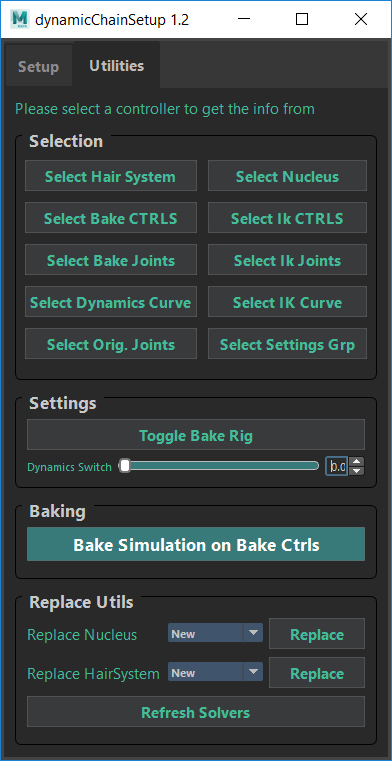 One of the most useful features in the tool is the Bake Simulation on Bake Ctrls feature. When you are happy with your simulation you can bake it onto the Bake Controllers. With this you can have your simulation as animation on the Bake Controllers where you can still tweak it or add it to an animation layer. To switch to the Baking Controllers chain, click on the Toggle Bake Rig button. You will see that the Baking Rig is an FK rig that corresponds to every joint you have. You can always redo the simulation but you have to set the Baking Rig back to 0, so you enable back the IK Setup that controls the dynamic rig. However your previous baked animation on the Baking Rig will be overwritten if you bake again. If at any point you decide that you would like to replace your current Nucleus or Hair System used for the rig, you can do that in the Replace Utils section. The Dynamic Chain menu gives you access to the most common used functions after creating the rig. So you don't have to load the tool every time you would like to Bake the simulation or select a rig component. When you generate the dynamic rig using the dynamicChainSetup tool, it creates a new group in the scene with the prefix give. You can parent this group under the driving controller or joint. For example in the gif attached we parent the tail dynamics group under a hips controller so it moves with the body. You can always control the visibility of the Baking Rig by selecting the Settings Controller and switching the Baking Rig attribute to 1. You can turn off the Dynamics simulation by by selecting the Settings Controller and turning the Dynamics Switch attribute to 0. You can use this option as well to blend between your IK rig animations and the dynamics, that is quite useful if you prefer to animate but want that extra bit of secondary animations or if you want to have a more stiff simulation. Multi selection support which was a limitation in the previous version. 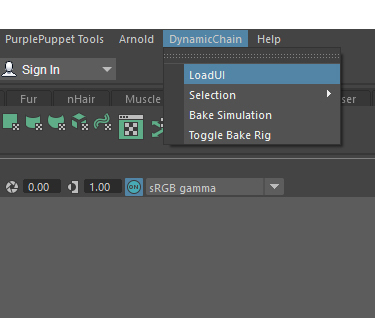 Now you can bake your animation on multiple chains and select rig components on multiple selections. DynamicChain Menu for fast access to the most used functions related to the rig. Support for adding a custom IK curve for the spline rig. The tool now creates a settings controller that the animator have direct access to instead of a hidden group. You may use the tool commercially. However you may not redistribute, rename or claim rights for the tool. Feedback, questions and bug reporting are always welcome. However do not expect the author to provide any extra features not shown or documented in the tool.